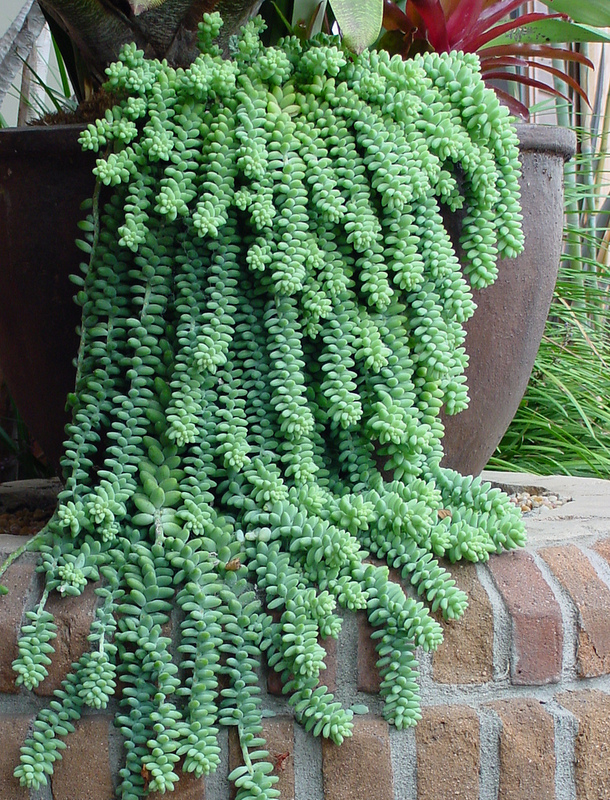 Donkey Tail Plants, otherwise known by their scientific name Sedum morganianum, are a succulent perrenial that makes an absolutely beautiful trailing plant; especially in warm climates. Succulents are known to be fairly low maintenance due to their propensity for retaining water. They tolerate heat and low water conditions too. I’m a big fan of them and like to see them mingled with other flowering plants like Joanne Brenner did below in her garden. Plant Trader, A shop on Etsy owned and operated by Joanne Brenner, creates “living gifts” of succulent plants. She makes centerpieces and favors and other very pretty plant decor. She also sells cuttings. 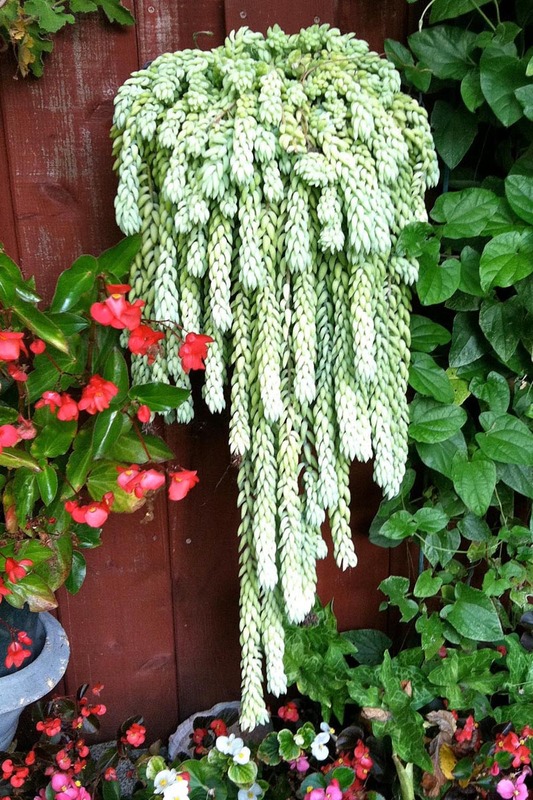 She made this gorgeous Donkey Tail plant that I’m just crazy about! Melissa J. Will a.k.a. 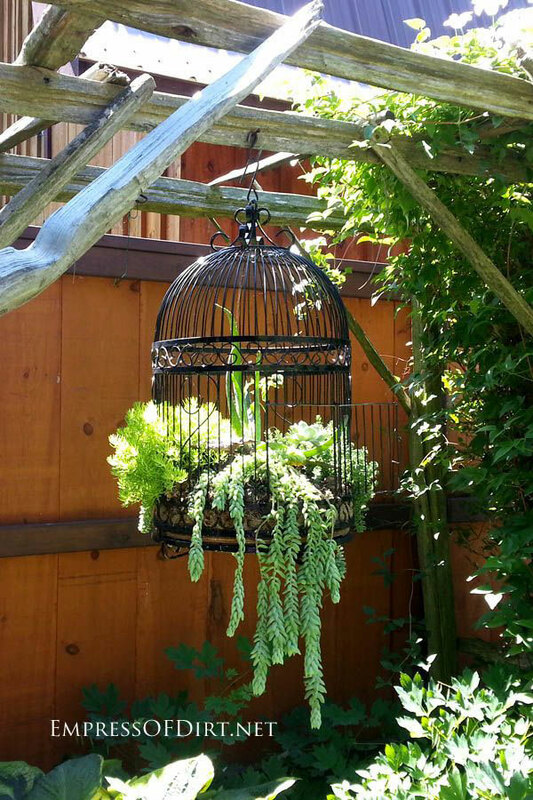 the Empress of Dirt created this impressive outdoor birdcage with Donkey Tails. It’s a very popular pin of mine on Pinterest. I love the name “Empress of Dirt” too and also her website. She’s an absolute maven of creative gardening ideas. 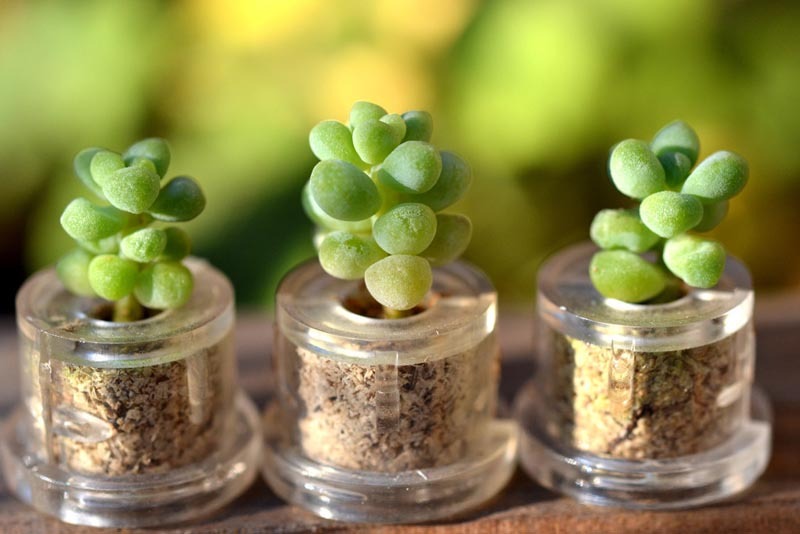 Here’s a beautiful specimen of Burro Tail as a container plant from dionysia These tiny little seedlings have been made into wearable terrarium necklaces and keychains. How creative is that! They’re from Wear it Mini Plants and they have many varieties. Donkey’s Tail is also cousin to Burro’s Tail, Lamb’s Tail and Horse’s Tail Cactus and Plants. They’re all very easy to propagate and begin new plants. They’re feminine and oh-so pretty. Here are some links to help you learn how to propagate and grow donkey tail plants.